G-DRIVE USB delivers high performance storage in a compact, yet stylish package. Encased in an all-aluminium enclosure and featuring a remarkably fast USB 3.0 interface, that meets the needs of the creative professional, this 7200RPM drive is perfect for storage-intensive multimedia files. G-DRIVE USB is Mac OS compatible, TimeMachine ready and available in several capacities, up to 6TB. G-Technology’s G-Drive range symbolises the pinnacle of high performance storage media over high speed USB 3.0. For creative, video and audio production professionals they are the consistently dependable hard drive of choice. The G-Drive distances itself from the rest of the pack with a bounty of features, as well as its style, ease of use and exceptional build quality, which enable the user to assimilate specialised and quick media storage into workflows. 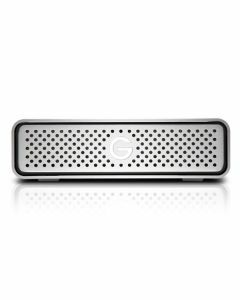 The G-Drive is, quite simply, the industry standard for video editors, audio production environments and music storage. G-Drive is the premium solution for storage intensive applications including audio/video editing, digital photography, MP3 libraries and high-speed data backup. The system delivers integrated heat-sink for near silent operation and cooling and cutting-edge external storage technology for Mac and PC: 7200 RPM SATA II hard drives with transfer rates up to 226MB/s, up to 6TB in storage capacity and up to 64MB of cache. G-Drive supports professional music production tools including Pro Tools, Logic Studio, Cubase, Nuendo, Digital Performer and others.